Collaborating, Learning, and Adapting (CLA) are not unfamiliar concepts to development professionals, but the effort to identify, design, and resource CLA provides a greater opportunity for informed decision-making and flexibility, which enables better results. CLA can be implemented through a wide number of activities, many of which are highlighted in this article, and through their alignment emerges a comprehensive CLA approach. 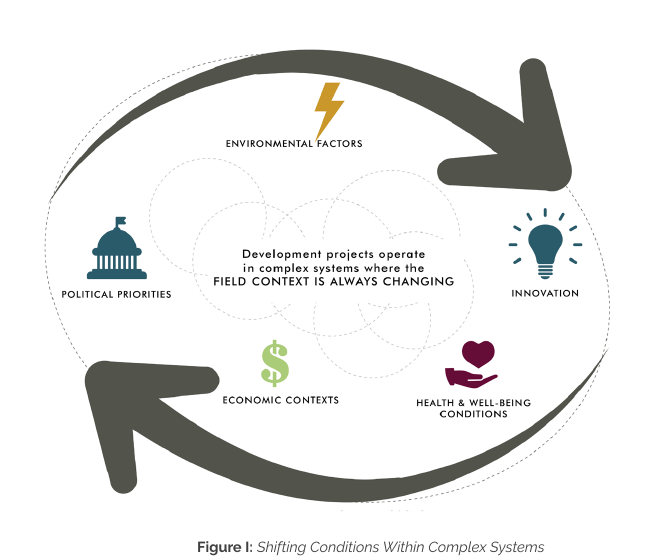 Development projects operate in complex systems, whether internationally or domestically. Political parties and priorities, environmental factors, economic contexts, advances in innovation and technology, and health and well-being conditions shift—sometimes overnight and sometimes over a prolonged period of time (see Figure 1). Goals and objectives that made sense at the onset of a project can become irrelevant over the three-to-five year period of performance, leaving project staff with no option but to fail or adapt. In these circumstances, adaptive responsiveness can make the difference between having a positive, neutral, or even a negative impact. These decisions must be informed and based in evidence, which is why Collaborating, Learning, and Adapting (CLA) plans and processes should be determined at the beginning of any project, and adjusted accordingly, throughout the life cycle of the project. USAID defines CLA as “a set of processes and activities that help ensure programming is coordinated, grounded in evidence, and adjusted as necessary to remain effective throughout implementation” (ADS 201, 2016). As a result, development programs operate best when they engage relevant stakeholders, utilize appropriate knowledge, and maintain flexibility. The CLA approach helps create the conditions for development success through strategic collaboration, continuous learning, and adaptive management. Collaboration engages stakeholders internally and externally through a variety of means to provide expertise, input, and feedback. Learning occurs when ideas and information are generated, captured, shared, and applied in an effort to improve practice. Adaptation enables positive change and improvement through lessons learned and informed decision-making. Many CLA activities are already undertaken during project implementation, but a CLA plan allows project staff to be intentional about designing and resourcing these activities. In planning for CLA, project staff should consider how various activities complement one another to achieve specific goals and objectives. The following questions can help identify the right activities. Who needs to be involved, when, and how? What resources are required or need to be developed? How will information be generated and shared? How will information and ideas be used for decision-making? 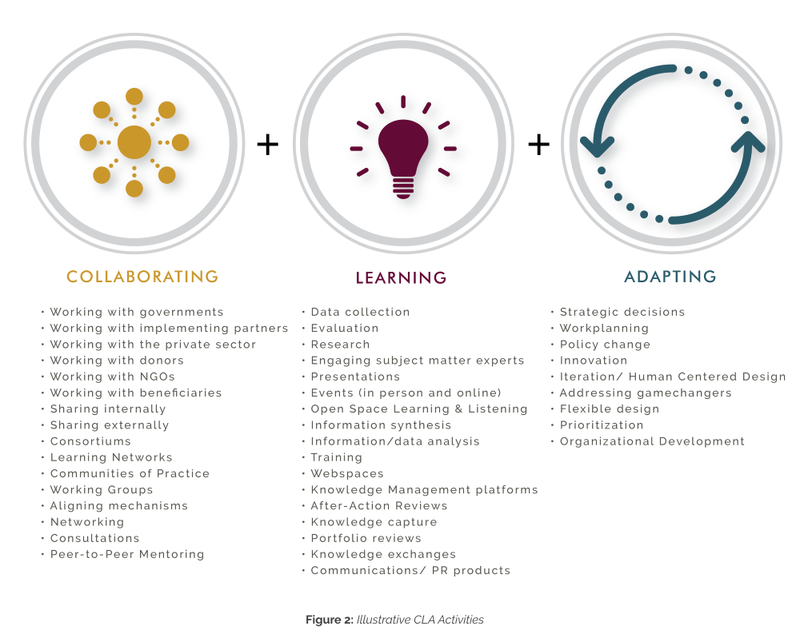 These CLA activities may include learning networks, communities of practice, trainings, learning events, as well as policy changes and strategic organization development – see Figure 2 to learn more about some of these illustrative CLA activities. Development projects are often already implementing many of these CLA activities in their day-to-day project work plan and exchanges with major stakeholders such as donors, governments, beneficiaries, and other implementing partners. Establishing a learning plan to fully understand how the project incorporates these activities, where gaps exist, and how to expand utilization of CLA measures, is the critical first step in becoming a CLA-centered and learning-focused development program. The QED Group has been working at the intersection of Monitoring, Evaluation, and Learning (MEL) for nearly 20 years, incorporating CLA designs and developments into our core business since the concept emerged in 2011. There is a natural transition and evolution of using the data and evidence generated through M&E efforts to inform decision-making, change management, and utilization. CLA provides a critical platform whereby stakeholders can be identified and engaged, knowledge is captured and disseminated, and adaptive management can occur. By facilitating a multi-faceted approach, CLA together with MEL creates a credible knowledge base and organizational culture upon which project goals and objectives can be effectively reached. Working with its Monitoring, Evaluation, and Learning Contract (The Learning Contract), implemented by The QED Group, the USAID/Uganda mission organized a “Collaborating, Learning, and Adapting (CLA) Peer Sharing Event,” in May 2016. The 3-day peer-assist event allowed USAID missions and implementing partners to exchange experiences and share examples of how CLA is being conceptualized in their work and put into practice. The event was organized into a series of common-interest topics, such as integrating monitoring, evaluation, and learning (MEL); operationalizing CLA; and knowledge transfer to smooth staff transitions. As part of the peer-assist approach, USAID/Uganda shared a current example of its CLA in Action. Through The Learning Contract, USAID/Uganda recently piloted an innovative MEL training course for mission staff and USAID/Uganda implementing partners. The course was conducted in two parts with time in between to apply selected MEL improvements so that participants could share their experience implementing these changes during the second part of the course. Beyond peer exchange, the event also included the opportunity for visiting staff to hear from USAID/Uganda’s Mission Leadership Council, other mission technical staff, and a Chiefs of Party panel from various projects about how they implement and leverage CLA at their various levels.